Veganism has skyrocketed in popularity. According to the Top Trends in Prepared Food report , the US has seen a 600% increase in people claiming to be vegan since 2014 – 6% of the population. More people are switching to a plant-based diet for health, to abstain from animal cruelty prevention and to lower their carbon footprint and preserve the environment. 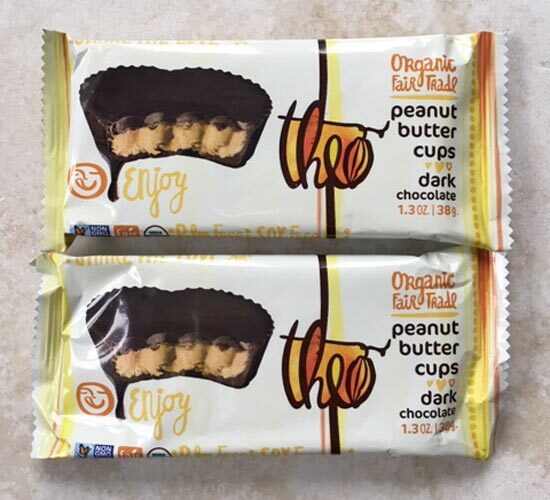 The transition to being vegan is being made increasingly easy by a number of things, including more vegan options on supermarket shelves and at popular restaurants. 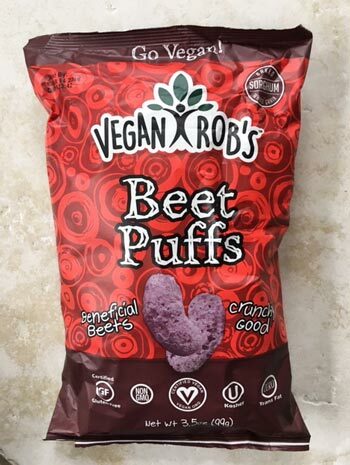 In addition, the vegan lifestyle is supported by food takeaway services, cosmetic and fashion brands switching to cruelty-free product lines, and subscription box services like All Around Vegan delivering plant-based goodies to your doorstep on a monthly basis. 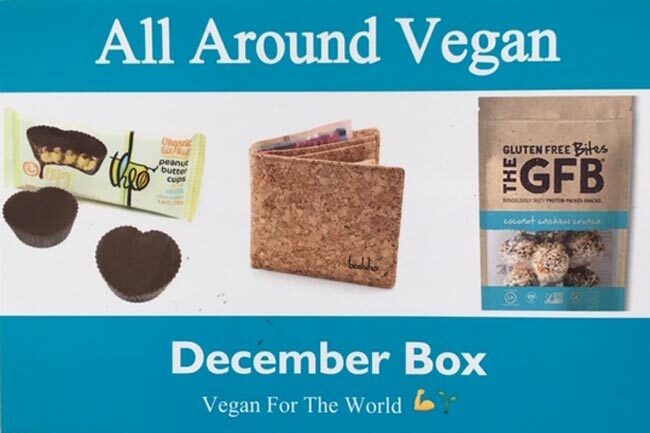 If you're thinking about signing up for an All Around Vegan box, or ordering a box as a gift for a friend, this review will give you all the information you need to make a decision, including an insight into some of the goodies from a recent box of mine. A vegan since his junior year, founder Ezra says he has always wanted to contribute to the movement. 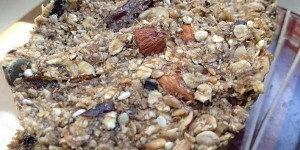 Coupling this desire with his innate entrepreneurial skills, All Around Vegan was born. Started in late 2017, this vegan subscription service is centered around the idea of helping others embark on and maintain a vegan lifestyle. Subscribe: To begin, you need to subscribe and choose a plan most suitable for you. Receive: Once subscribed to a plan, sit back and wait for your vegan box in the mail, each month, or as a one-time purchase. You choose. Get active: Here comes the most fun part: enjoying the surprise! Consume your vegan products and utilize the cruelty-free resources to improve your lifestyle. And don’t forget to share the word! My December box of treats! Month-to-Month Recurring Subscription: Priced at $34.95, this plan will entitle you to a monthly box to support your decision of personal and sustainable change. 3-month Prepay Subscription: Valued at $98.85, you’ll get a $6 discount when you pay for a 3-month subscription. 6-month Prepay Subscription: Bag a higher discount when you pick the 6-month plan at $191.70. Single Box/ Gift Box: Priced at $36.95, this option doesn’t require you to buy a subscription. It’s a one-time purchase; a very good way to test the waters. So what awaits you in your next box? 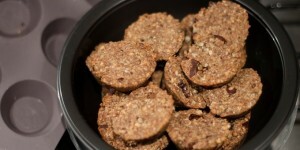 Well, lots of vegan goodies that'll bring plant-based joy to your mailbox. The benefit of having a subscription box is largely the element of surprise. It's really cool to get something in the post each month and not quite know what goodies will be inside. Rest assured it's all good quality brands, though. 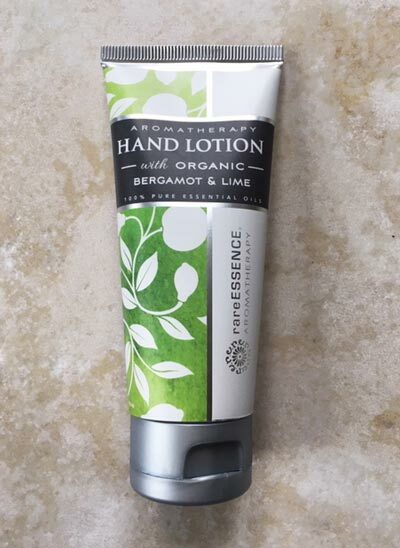 For example, last month I received some Rare Essence aromatherapy hand lotion with organic bergamot and lime. This was timely considering the winter is upon us and my hands are likely to be drying out. It's cruelty-free and phthalate-free. For a hand cream of this quality, you'll be looking at at least $8. I also received a cork wallet, which was fantastic because I really struggle to find a wallet big enough off for my needs that isn't leather. 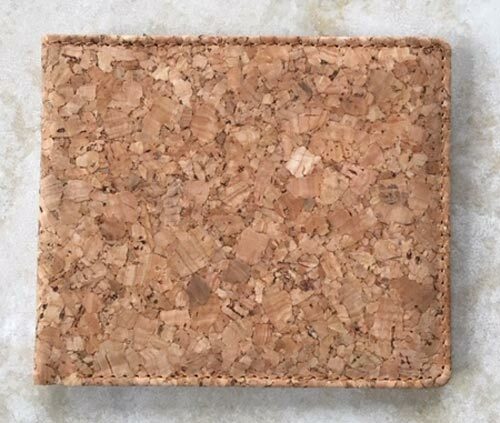 Cork is one of the most eco-friendly alternatives to leather, because the growing of cork captures carbon dioxide from the atmosphere. The wallet is really lightweight and will be great for my pocket. Interestingly, I recently visited a vegan festival and some of the cork wallet brands on sale were upwards of $25 a piece! So to get one in my box was a bonus! Super. I really wanted one of these cork wallets. Ultra-eco friendly! Plenty of space for my cards. 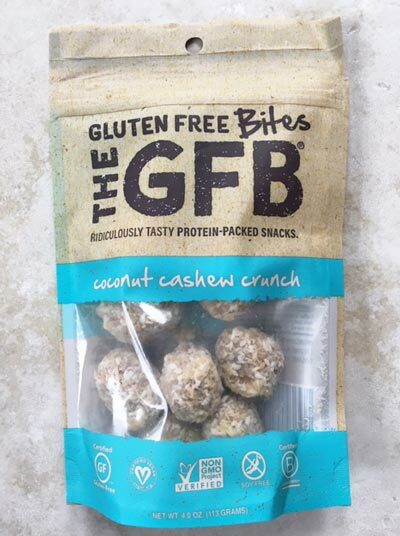 I also got some GFB Gluten Free Coconut Cashew Bites (approx $5 retail), some Vegan Robs Wild Rice Beet Puffs (approx $2-3 retail), 2 packs of Theo's Organic Fair Trade Peanut Butter Cups (approx $2.50 retail), and some temporary vegan tattoos (just for fun for Christmas) and a badge – among other things. When you calculate the retail worth of the goodies, it comes to somewhere around $45 – well over what you pay for the box. And if you're in the US the postage is free. On that last point, you can always give anything you don't want to a friend or family member as a birthday present or simply a gift. For example, we're giving the temporary tattoos to my daughter, as she enjoys stuff like that. My wife has already claimed the peanut butter cups! What’s in the AAV Shop? In addition to the online subscription service, All Around Vegan has an online shop, which is well worth checking out as there's some very cool items, in particular T-shirts and beanies. Vegan Emoji Cap: If beanies are not your thing, you can opt for their vegan cap to promote a positive message! ‘You’re Not a Baby Cow’ T-shirt. Available in Medium to XL sizes. ‘Nothing Humane Happens in a Slaughterhouse’ T-shirt. This cool 100% cotton tee is available in both Unisex and Women’s cut. Go Vegan Activism Banner: Take your advocacy to a higher level by sending a clear message for the veganism movement with this Go Vegan Activism Banner. 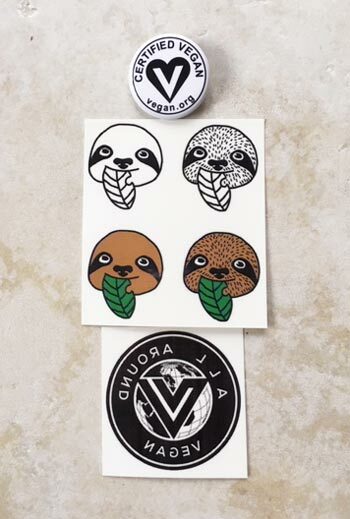 A Variety of Activism Stickers: Get a sheet of 6 stickers for $1.50 and spread the message! A bit of activism. My daughter will enjoy wearing the temporary tattoos. 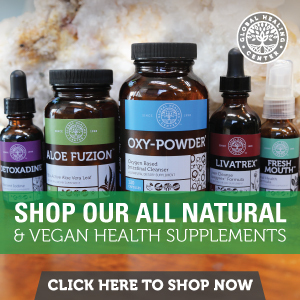 You can easily subscribe to All Around Vegan and pay on a monthly basis, as a one-time purchase, or every 3 months or 6 months. Your boxes will automatically be delivered to your door every month. You can cancel or modify your subscription anytime, no strings attached. All Around Vegan guarantees SAFE checkout and supports most payment merchants such as VISA, Mastercard, AmEx, PayPal, Apple Pay, and Shopify Pay. The usual blurb. Billing happens on the 15th of each month, and the shipping of each box is done between the 1st and 5th day of the month. For example, if you subscribed for a monthly plan on October 27th, you will be billed at that time and your first box will be shipped between November 1st to 5th. If you’re in the US, your box is expected to be delivered within 3-5 business days. On November 15th, you will then be billed again for the December box to be shipped on December 1st to 5th. So on and so forth. 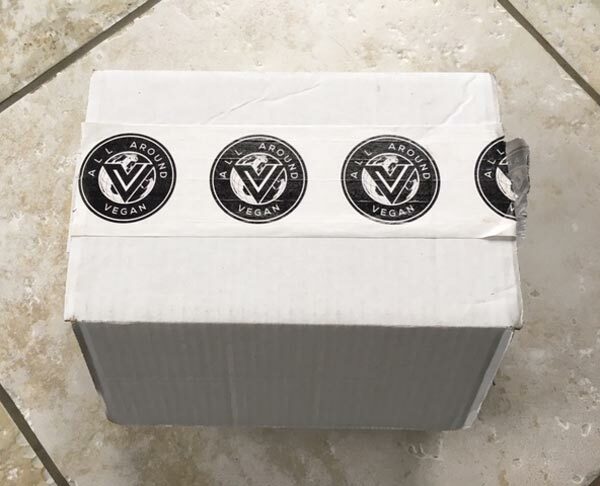 All Around Vegan sends out shipments via USPS Priority Mail. If you’re in the US, your box is expected to be delivered within 3-5 business days upon receiving the confirmation email. If you’re purchasing from outside the US, remember that tax and shipping are excluded from the subscription price. If the parcel passes through customs, you may be charged additional charges (tax), which must be paid by the recipient. Customs policies vary greatly from one country to another, so if you’re not familiar with yours, get in touch with your local office to prevent any surprises. Not satisfied with your subscription? No problem. You can cancel your membership and monthly payments at any time. You can discontinue your subscription before getting re-billed for the next shipment by sending an email to info@allaroundvegan.com prior to the renewal/billing date (15th of the month). If by chance, your subscription has already been renewed and you’d like to cancel the forthcoming shipment, a refund is eligible only if you request cancelation before the 25th of the month. Any refund requests made after the 25th or on boxes that were already shipped will not be possible. 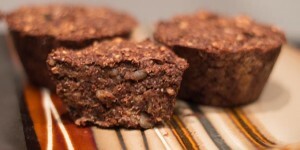 All Around Vegan subscription plans make great gifts too. You can support a loved one or friend on their vegan journey by surprising them with a box from All Around Vegan. You can personalize a gift box by writing a message in the Order Notes before checkout and it will be printed on a card.